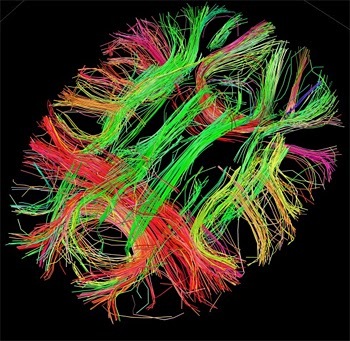 White matter fiber architecture of the brain. A new study by researchers at the University of California, Berkeley has shown that chronic stress generates long-term changes in the brain that may explain why people suffering chronic stress are prone to mental problems such as anxiety and mood disorders later in life. The findings could lead to new therapies to reduce the risk of developing mental illness after stressful events. It's long known that people with stress-related illnesses, such as post-traumatic stress disorder (PTSD), have abnormalities in the brain, including differences in the amount of gray matter versus white matter. Gray matter consists mostly of neurons, which store and process information, and support cells called glia. On the other hand, white matter is comprised of axons, which create a network of fibers that interconnect neurons. White matter gets its name from the white, fatty myelin sheath that surrounds the axons and speeds the flow of electrical signals from cell to cell. How chronic stress creates these long-lasting changes in brain structure is a mystery that researchers are only now beginning to unravel. In a series of experiments, Daniela Kaufer, UC Berkeley associate professor of integrative biology, and her colleagues, including graduate students Sundari Chetty and Aaron Freidman, discovered that chronic stress generates more myelin-producing cells and fewer neurons than normal. This results in an excess of myelin – and thus, white matter – in some areas of the brain, which disrupts the delicate balance and timing of communication within the brain. "We studied only one part of the brain, the hippocampus, but our findings could provide insight into how white matter is changing in conditions such as schizophrenia, autism, depression, suicide, ADHD and PTSD," she said. The hippocampus regulates memory and emotions, and plays a role in various emotional disorders. Kaufer and her colleagues published their findings in the Feb. 11 issue of the journal Molecular Psychiatry. Myelin is stained blue in this cross section of a rat hippocampus. Myelin, which speeds electrical signals flowing through axons, is produced by oligodendrocytes, which increase in number as a result of chronic stress. 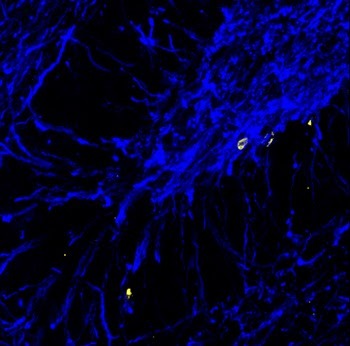 New oligodendrocytes are shown in yellow. Credit: Aaron Friedman and Daniela Kaufer. Does stress affect brain connectivity? Kaufer’s findings suggest a mechanism that may explain some changes in brain connectivity in people with PTSD, for example. One can imagine, she said, that PTSD patients could develop a stronger connectivity between the hippocampus and the amygdala – the seat of the brain’s fight or flight response – and lower than normal connectivity between the hippocampus and prefrontal cortex, which moderates our responses. "You can imagine that if your amygdala and hippocampus are better connected, that could mean that your fear responses are much quicker, which is something you see in stress survivors. On the other hand, if your connections are not so good to the prefrontal cortex, your ability to shut down responses is impaired. So, when you are in a stressful situation, the inhibitory pathways from the prefrontal cortex telling you not to get stressed don’t work as well as the amygdala shouting to the hippocampus. This is terrible! You have a much bigger response than you should." she said. She is involved in a study to test this hypothesis in PTSD patients, and continues to study brain changes in rodents subjected to chronic stress or to adverse environments in early life. Kaufer’s lab, which conducts research on the molecular and cellular effects of acute and chronic stress, focused in this study on neural stem cells in the hippocampus of the brains of adult rats. These stem cells were previously thought to mature only into neurons or a type of glial cell called an astrocyte. The researchers found, however, that chronic stress also made stem cells in the hippocampus mature into another type of glial cell called an oligodendrocyte, which produces the myelin that sheaths nerve cells. The finding, which they demonstrated in rats and cultured rat brain cells, suggests a key role for oligodendrocytes in long-term and perhaps permanent changes in the brain that could set the stage for later mental problems. Oligodendrocytes also help form synapses – sites where one cell talks to another – and help control the growth pathway of axons, which make those synapse connections. The fact that chronic stress also decreases the number of stem cells that mature into neurons could provide an explanation for how chronic stress also affects learning and memory, she said. Kaufer is now conducting experiments to determine how stress in infancy affects the brain’s white matter, and whether chronic early-life stress decreases resilience later in life. She also is looking at the effects of therapies, ranging from exercise to antidepressant drugs, that reduce the impact of stress and stress hormones. 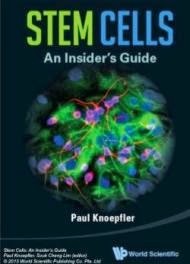 Kaufer’s coauthors include Chetty, formerly from UC Berkeley’s Helen Wills Neuroscience Institute and now at Harvard University; Friedman and K. Taravosh-Lahn at UC Berkeley’s Department of Integrative Biology; additional colleagues from UC Berkeley and others from Stanford University and UC Davis. The work was supported by a BRAINS (Biobehavioral Research Awards for Innovative New Scientists) award from the National Institute of Mental Health of the National Institutes of Health (R01 MH087495), a Berkeley Stem Cell Center Seed Grant, the Hellman Family Foundation and the National Alliance for Research on Schizophrenia and Depression.